This crunchy, colourful salad (as featured in S Mag) is beautifully fresh and simple to prepare for a crowd. Being a caterer means you require a lot of variations on classic meals, I’m a huge fan of this particular dish because it’s so versatile and quick – ideal for BBQ season too! 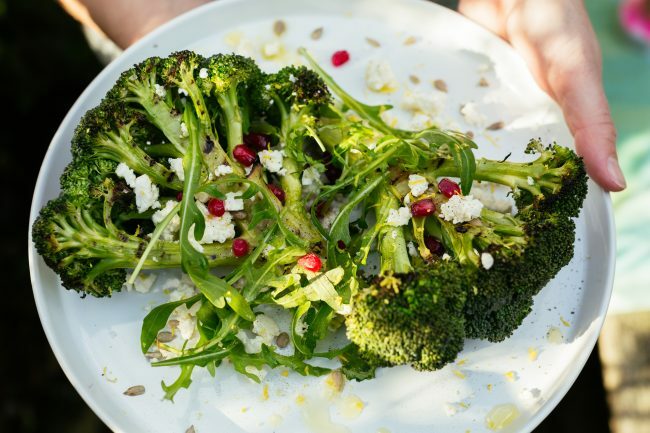 Feel free to pimp up your broccoli with your favourite cheese (ricotta and feta work well) or even BBQ’d sweetcorn straight from the coals. 2. Slice the broccoli heads in half and brush with garlic and oil. 3. Place a griddle pan, alternatively a frying pan, on a high heat. When it’s hot, griddle the broccoli. 4. Once marked, drizzle with oil and lemon juice, cook for a further 10 minutes in the oven at 180c, until tender. 6. Serve on a gorgeous plate. Enjoy!